What could be better than eating healthy and not even noticing it? Look, there’s nothing overtly “diet” here—this all came about by accident. But it’s no surprise that tapping into Mediterranean ingredients would make something so simple taste so good. The bell peppers, tomatoes, and onions for the sauce are first grilled, then processed. Lemon, olives, and capers give the sauce zip; goat cheese adds richness. And here’s a secret: Top toasted baguette slices with the sauce and goat cheese—instant easy appetizer! Coat peppers, tomato, onion, and garlic with 2 T. oil. Thread 2 skewers through the onion to create a “lollipop;” wrap garlic in foil. Grill vegetables until peppers char, about 8 minutes, turning occasionally. 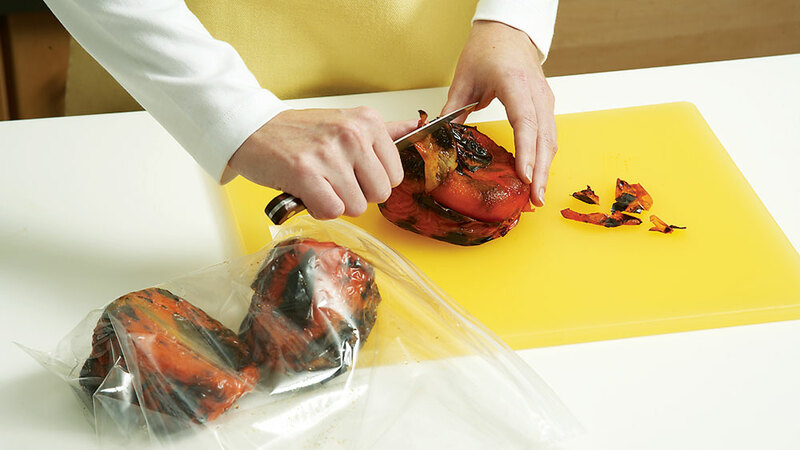 Transfer peppers to a plastic bag to steam; when cool enough to handle, remove skin and seeds. 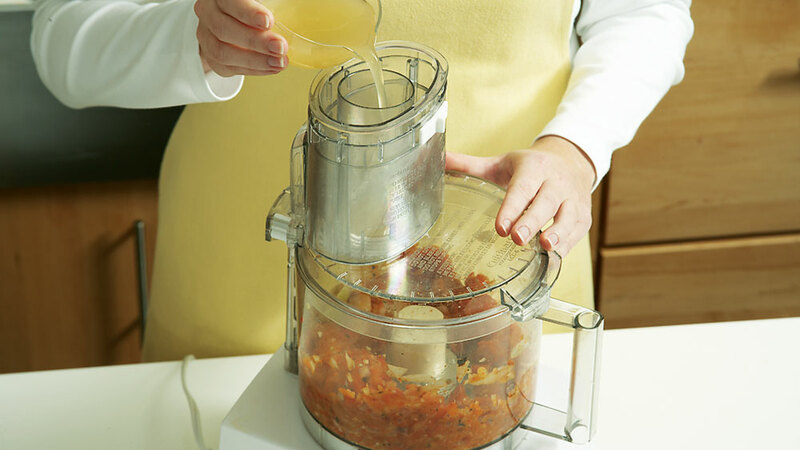 Pulse grilled vegetables and garlic in a food processor with lemon juice until chunky; transfer to a bowl. Stir in olives, capers, vinegar, and 1 T. oil. Just before serving, fold in parsley, salt, and pepper. Grill chicken until cooked through, about 6 minutes per side. 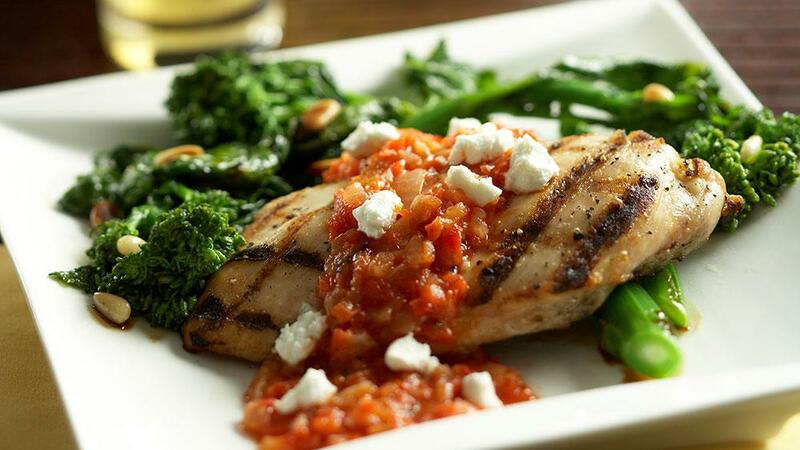 To serve, spoon red pepper sauce over chicken, then top with goat cheese and finish with a drizzle of olive oil. 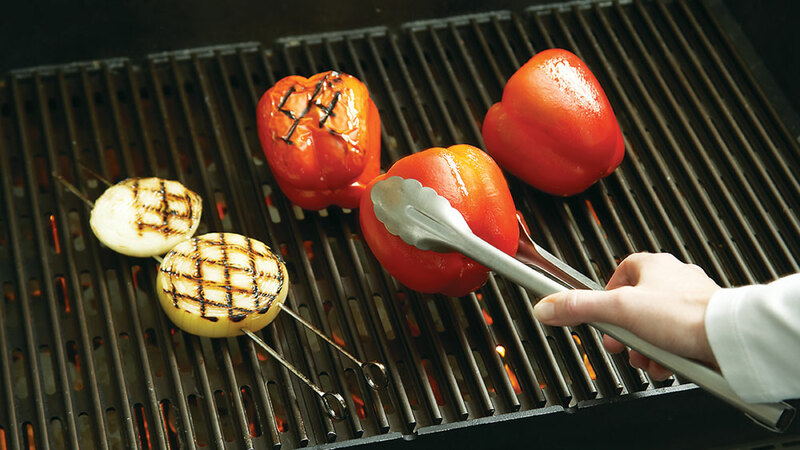 Grill vegetables until charred (the peppers will take the longest). Skewer the onion to keep it intact. Steam the peppers in a bag, then peel off the charred skin. This can be done 1–2 hours ahead. Pulse vegetables with the lemon juice in a processor. Don’t over-blend into a smooth puree. 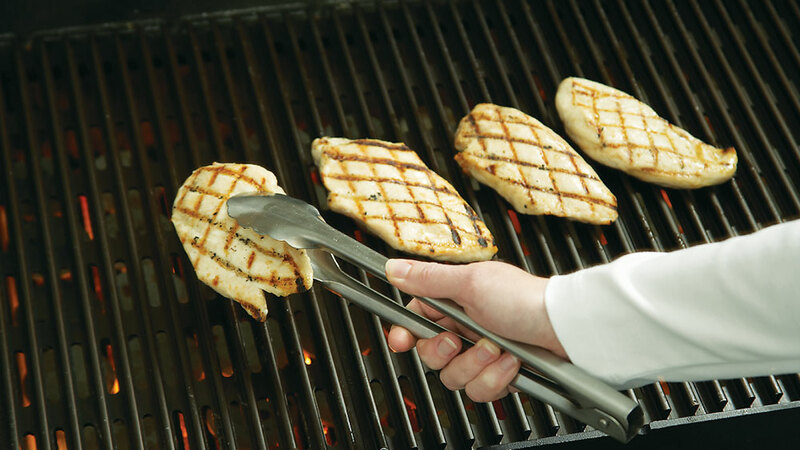 Grill chicken until cooked to 165°. Making the crosshatch marks is optional, but pretty.